The astronaut in this Apollo 17 photo was probably harmed by the radiation to which he was exposed on his voyage. The earth has been magnificently designed for life. Amongst its amazing contrivances for nurturing and protecting living organisms, its magnetic field shields its surface from most of the high-energy radiation to which it is exposed. If it weren’t for this protective shield, life as we know it could not exist on earth. So what happens when people venture beyond that protective shield? A recent paper in the journal Scientific Reports attempts to answer that question by studying astronauts. While it suffers from the unavoidable weakness of using a very small group of individuals, the results presented in the paper are very interesting. The researchers who wrote the paper examined five women and 37 men who had spent some time in space. All five women and 30 of the men experienced low-earth orbit, while seven of the men were a part of the various Apollo missions that went to the moon. These astronauts were compared to three women and 32 men who have been trained as astronauts but have never gone into space. Both of those groups were also compared to the U.S. population of the same age range. Specifically, the researchers were looking for the mortality rates among the astronauts, as well as what caused their deaths. What they found was that the astronauts who never went into space were less likely to die from cardiovascular disease and other common ailments (such as cancer) than the rest of the population in the same age range. This makes sense, since health is one of the factors used to choose astronauts, and their training keeps them healthy. However, they were more likely to die from accidents than the rest of the U.S. population. Once again, this makes sense, since being an astronaut is a dangerous line of work. However, when the astronauts who never went into space were compared to the Apollo astronauts, there was one striking difference. 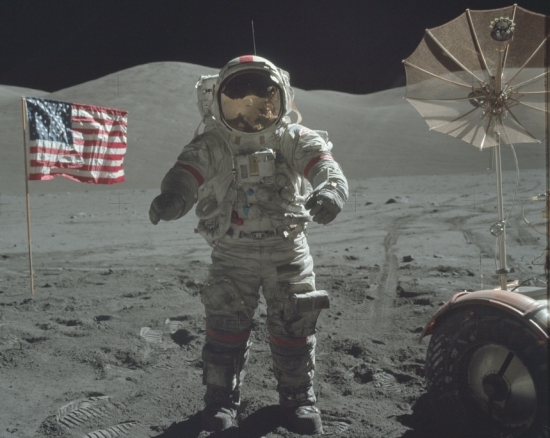 The percentage of Apollo astronauts who died of cardiovascular disease was five times greater than the corresponding percentage in the group of astronauts who never went into space! Surprisingly, there were no significant differences in the others causes of death. Thus, as far as these results indicate, traveling to the moon and back increases a person’s risk of death by cardiovascular disease, but not death by cancer or other diseases! In this graph, the “non-flight” results are for those astronauts who never went into space. The “low earth orbit” results are for the astronauts who went into space but not to the moon. The “Apollo lunar” results are for those who went to the moon, and the “all flight” results represent the combined results for the “low earth orbit” group and the “Apollo lunar” group. It’s very important to understand that there are statistical considerations you must make when viewing these results. Because the number of astronauts studied is low, some differences between them can crop up as a result of random chance. 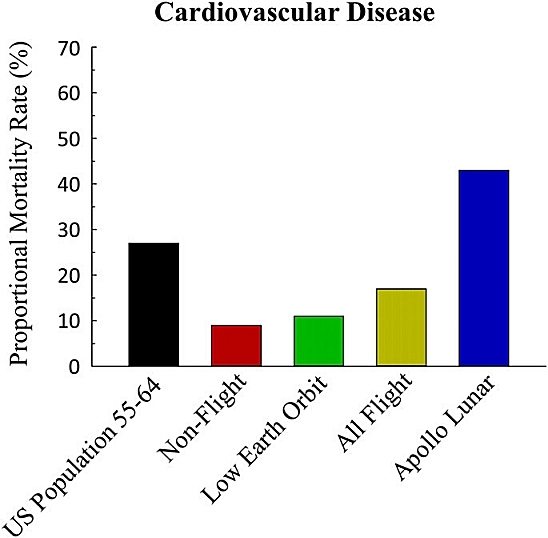 Thus, even though the percentage of low-earth orbit cardiovascular deaths is higher than the non-flight cardiovascular deaths, the difference is not statistically significant. That means we don’t know whether the difference you see in the graph is the result of random chance or is real. However, despite the small group size, the difference between the “Apollo lunar” group and the other astronauts is probably real, because statistical considerations indicate that it is significant. Does this mean we know for sure that a trip to the moon increases your chance of dying from cardiovascular disease? No. However, this study does provide some evidence to suggest that. If this had been the end of the study, I probably wouldn’t have blogged about it, since the number of people studied is so small that even when you do the statistical tests, you can’t be confident that the difference seen in the study is real. However, the researchers did one more thing that adds weight to their results. The researchers studied mice under three different conditions and compared them to a control group that were give no special conditions. They elevated the hindquarters of some mice for 14 days. This is a common technique used to simulate weightlessness for the hind legs. They irradiated another group of mice to simulate the radiation experienced by astronauts. They did both of those things to a third group of mice. Compared to the control group, they saw no difference in various cardiovascular indicators in the mice who were given only simulated weightlessness, but they did see elevated problems in the cardiovascular indicators of the mice that were irradiated as well as those who experienced both simulated weightlessness and irradiation. While there still needs to be further study on this issue, I do think the paper provides good evidence that space travel can elevate a person’s risk due to cardiovascular disease. Furthermore, it is probably mostly due to the increase radiation exposure. Of course, that would never cause me to turn down an opportunity to travel to the moon or another planet! Thank you for this blog post. This reminds me of something I wanted to ask you about that appeared in one of your textbooks (I think the Physical Science one) about the rapid decay of planetary magnetic fields. We have since sold the textbook (after using it with all 4 of our children!) but I remember you making a convincing case that the time required for the magnetic fields of planets in our solar system to decay significantly is on the order of thousands of years, not millions nor billions. You cited this as evidence of a relatively young earth, and I took it seriously. However you neglected to mention the “elephant in the room”: rapid decay of the earth’s magnetic field means all life on earth will be extinguished in just a few thousand years! Had you considered that logical consequence? Similarly, I remember you saying (I think on this blog) that comparing our sun with other stars, we seem to have a very young star that is projected to grow significantly hotter. You cited this as evidence for a young earth, because millions of years ago it would have been too cold for dinosaurs. I found that to be a convincing argument. But yet again you ignored the “elephant in the room” – by the same argument our sun will grow hot enough to extinguish all life on earth, and it won’t take millions of years for that to happen either. Did you overlook those logical consequences, or did you just not want to frighten people? For anyone reading this post and becoming fearful – if Dr. Wile is correct about the relatively rapid decay of the earth’s magnetic field and the relatively rapid increase in the heat of our sun, consider that he might also be correct about a loving Creator that set it all in motion and has a plan for us. Also in this context “rapid” means in thousands of years, as opposed to millions or billions. I don’t know if the growth in the brightness of the sun is projected to be linear or exponential or what, Any ideas on when the sun is projected to be so powerful as to destroy all life on earth? Seems like it would be much sooner than the 3.8 billion year number quoted above. And why does no one talk about this logical consequence? If I remember correctly, the rapid decay of the earth’s magnetic field would make the earth uninhabitable much sooner than that, on the order of only thousands of years. You are correct. See my reply to your previous comment. Thanks for your comment, David. I hadn’t overlooked either of those consequences. The sun consequence is the least important, because it will warm on a timescale of hundreds of millions of years. Here is the latest on that issue. The consequence of a rapidly-decaying magnetic field does indicate that there will be an end to life, on the timescale of thousands of years. If you read his original paper, he calculates that every 2,000 years, the magnetic field decays to 36.8% of the given value. So, in 2,000 years, it will be 36.8% of what it is right now. I don’t know of any calculation that tells us what the critical value of the magnetic field strength is for life on earth, but at some point, it will reach that value, and life on the surface will no longer be possible, assuming the model is correct. Here is the latest on that issue. It sounds like “Icarus” may have been a more apt name for the program than “Apollo.” I had been under the impression that some kind of shielding for known radiation in interplanetary spaces was employed in the design of the habitation modules and spacesuits. Either there wasn’t any or it was inadequate. There was shielding, Jim, but it was just not possible to have thick enough shielding in the ship, as it would require too much fuel to escape earth’s gravity. The shielding in the suits had to be even thinner, since they had to be able to walk in the suits. The shielding was the best they could do, but it obviously wasn’t enough! The word “consciousness” has several different meanings. Sometimes, it just means being aware of what is happening around you. In that case, animals have consciousness. However, it often is used to indicate the awareness of your own mind. In that case, animals have no consciousness. I prefer Aristotle’s terminology, where animals are sentient, meaning they can sense and respond to what is happening around them. Humans, on the other hand, are rational, which means they can deal with abstractions. In that terminology, plants are sentient, because they can sense what is happening outside of them and respond. This sense goes beyond the simple examples like growing towards the light. We now know, for example, that they can communicate with one another and can even help one another in certain circumstances (see here and here). However, neither plants nor animals are rational. 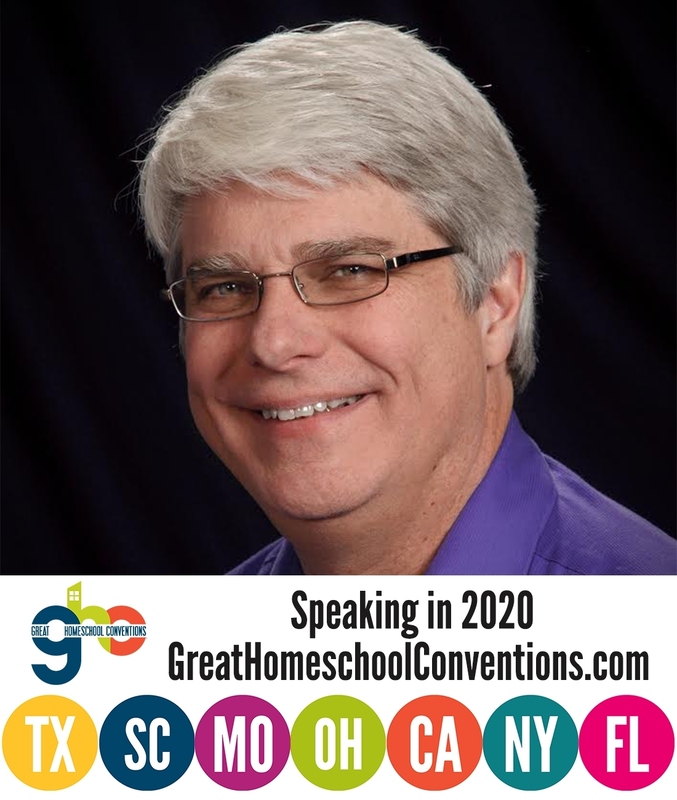 The Latest Numbers on Homeschooling From The U.S. Department of Education The Reviews (At Least Some of Them) Are In!